The seven astronauts on shuttle Atlantis have bid farewellto the crew of the space station and are gearing up to undock on Wednesday. STS-129 shuttle commander Charlie Hobaugh led the crew inlast goodbyes, after his team spent about a week at the orbiting laboratory deliveringspare parts and paving the way for the final building stages of thestation. Hobaugh and company shut the hatches between their orbiterand the International Space Station (ISS) Tuesday afternoon, and they plan todetach from the outpost at 4:53 a.m. EST (0953 GMT) Wednesday and head back toEarth for a landing at 9:44 a.m. EST (1444 GMT) on Friday. Departing with Hobaugh are pilot Barry Wilmore and missionspecialists Leland Melvin, Randy Bresnik, Mike Foreman and Robert"Bobby" Satcher, Jr. A seventh crewmember, NASA astronaut NicoleStott, will join them on thereturn trip after spending about three months on the station as anExpedition 21 flight engineer. "It's just been a really amazing adventure, and I thinkthe station is better for it, and I'm just really thankful to have had a partin it," Stott said of her mission Tuesday. Earlier today during a change-of-command ceremony ISScommander FrankDeWinne of Belgium officially transferred control of the station to newcommander Jeff Williams of NASA. Williams presented Stott with a gold pin to commemorate herfirst flight in space, a NASA tradition. "Usually they get it when they're back on theground," Williams said. 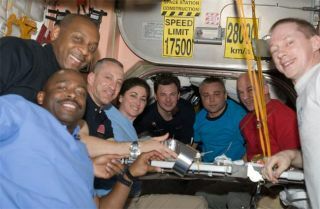 "I thought it would be special to bring ithere and present it onboard the space station. Congratulations on a verysuccessful expedition." The shuttle astronauts are capping off a smooth mission,where they accomplished all their main objectives plus some get-ahead chores toleave the station in good shape. At this point the space laboratory is about 85 percentcomplete, said Dan Hartman, ISS manager of integration and operations. "The crew is doing really well, they're in good spiritsand everybody is ready for the mission to wrap up," lead shuttle flightdirector Mike Sarafin said Tuesday. "Everybody has been working reallyhard." The astronauts spent the morning transferring some lastpieces of cargo over to the shuttle, including a broken part to the station'surine recycler, which NASA plans to analyze on the ground to figure out whatwent wrong. Many of the shuttle astronauts said they were most excitedto see their families once they got back to the ground. One spaceflyer with aparticular longing for home is Randy Bresnik, whose wifegave birth to the couple's baby daughter while he was in space. "It was just wonderful to find out the news,"Bresnik said. "I think the common theme you'll hear from all of us is wejust want to see our families as soon as possible." SPACE.com is providing complete coverage of Atlantis'STS-129 mission to the International Space Station with Staff Writer Clara Moskowitz and Managing Editor Tariq Malik based in New York. Click here for shuttle missionupdates and a link to NASA TV.